A casserole fit for kings. 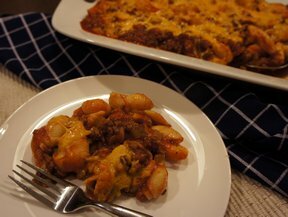 This has all the goodness of rich and hearty chili along with some pasta to soak up all that tomato sauce. 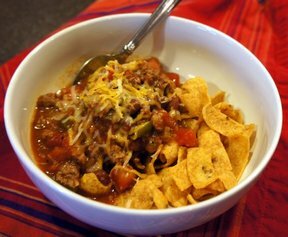 This is a perfect way to change up leftover chili. 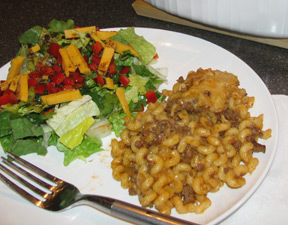 In a skillet, brown ground beef, onion, celery and green pepper until no longer pink; drain. Add tomatoes, juice and beans to beef mixture. Season with salt, pepper and chili powder. Simmer for 30 minutes, until vegetables are tender. 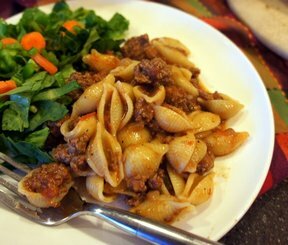 Combine beef and tomatoes and drained pasta. Mix well. Pour into a casserole dish. Sprinkle with cheese. "This recipe should have stated 8 ounces of pasta. The ingredients have been corrected. Thanks micherrera for pointing this out." "How big is the box of pasta? 8 ounces? 16 ounces? Thanks!" "Mmmm, everyone loved this at our house. Great meal for low budget."